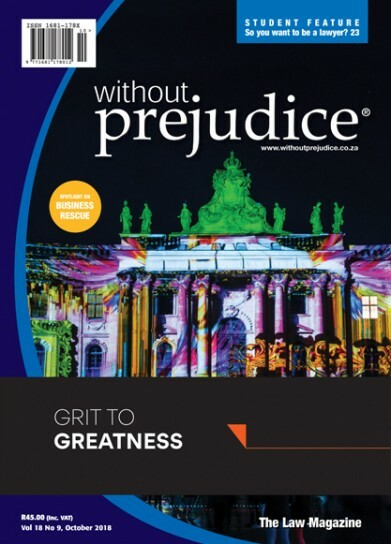 October is an important month on the Gleason Publications calendar: without prejudice was first published in October 2001, an impossible-to-believe 17 years ago. And a special anniversary, 20 years ago, Gleason Publications opened its doors on 28 October. In the Business Day on 17 August, it was reported that: "Banks have not yet restored lending to several state-owned enterprises (SOEs), underlining the urgency of talks between the government and financial institutions to establish a loan facility through which credit can be channeled. In terms of s129 of the Companies Act (71 of 2008), a company may only enter business rescue if it is both financially distressed and there is a reasonable prospect of it being saved. Without access to sufficient post-commencement finance (as contemplated in s135 of the Companies Act (71 of 2008)), the chances of rescue for a company in business rescue are slim. It has become a common phenomenon that applications are brought to put into business rescue, companies which are already in liquidation – sometimes long after the liquidation commenced. This raises some interesting questions about whether employees and trade unions remain affected persons for the purposes of such a business rescue application, given that in terms of s38 of the Insolvency Act (24 of 1936), all employment contracts are deemed to be cancelled within 45 days after the appointment of a final liquidator. It is understood that a Companies Amendment Bill is in the pipeline. An aspect of our takeover law that could do with some clarification in that process is that of voluntary offers (sometimes referred to as "tender offers") that are made generally to shareholders of a regulated company where the offeror seeks to obtain less than the threshold for "control" as is understood in our takeover law, namely 35% (definitions of "control" and "prescribed percentage" in regulations 81(e) and 86(1)). For example, an offeror announces generally to shareholders of a widely-held public company that it wishes to acquire up to 34.9% of that company, on a first come, first served basis. A "regulated company" is any public company or state-owned company, or a private company where more than 10% of the securities were transferred in the past 24 months amongst unrelated persons (s118(1) of the Companies Act read with regulation 91 of the Regulations). "Feminism isn't about making women strong. Women are already strong. It's about changing the way the world perceives that strength." The judgment of the Western Cape High Court in Mlungwana v S  3 All SA 183 (WCC) is the latest of the shots that have been fired at the criminal sanctions in s12 of the Regulation of Gatherings Act (205 of 1993) (RGA), where these sanctions are used to criminalise peaceful protests. The Mlungwana case involved a peaceful protest where the protesters gathered, without giving notice in terms of s3 of the RGA. The protest was about the lack of proper sanitation infrastructure in Khayelitsha, a township near Cape Town. Some protesters chained themselves to the railings of the Civic Centre building while others sang and held placards. "There's no place like home". These phrases we hear quite often depict how nice it is to get home after a long day of school or work or after being away from home for a while. However, for those who experience domestic violence, do these sayings still hold true? Coca-Cola bought the coffee chain Costa for $5.1 billion. UK and US lawyers must be rubbing their hands in glee at the work that will spin out of this acquisition. Clifford Chance represents Coca-Cola on corporate matters and Skadden is advising the company on tax issues. Whitbread is the parent company of Costa and Slaughter and May represents it, while Ashurst is advising Whitbread's banks. What I wanted to achieve with the 2018 edition of "So you want to be a lawyer?" was to ensure that students of law, if they are not already aware of the many fascinating roads there are to travel with a law degree, would be by the end of the feature. And students will also be aware that technology will undoubtedly shape the future. When I registered to study for my law qualification, I did so with a significant degree of naïvety. I operated on the assumption that after qualifying, I would walk straight into a job at one of the biggest banks in the country, wear a fancy suit, drive a luxury car, make a packet of money and live happily ever after. I could not have been more wrong. I did – I grew up with the idealistic notion that many of us have about being a lawyer: standing up in front of a packed court room, donning an elegant black robe, arguing with passion and conviction, waving our fingers and stunning the judge before us with a nuanced and impressive argument. "Ally McBeal" (the "Suits" of my generation) also helped to glorify the idea that I would become a powerful, designer-pencil-skirted defender of justice. The legal profession has been held in high esteem for centuries. Consequently, it's not surprising that many young people in South Africa, and around the world, still choose law as their career path. Every year there is an influx of law graduates into the legal field. For some, it was the appeal of a reputable and noble profession, for others, it was a process of elimination but, more often than some would like to admit, it was the TV influence of Danny Crane or Harvey Spector – whatever your reason was for choosing law, you have earned (or are about to earn) your LLB degree and then there are a few choices to be made to get this legal career of yours going in an upward trajectory (hopefully).